Although there is general consensus among educators of English learners (ELs) regarding the need for contextualized language development, it is not widely implemented. This chapter explains the theory behind this shift in teaching English language development and for teaching ELs in general. The chapter also discusses the kind of professional development teachers need to make this shift, and the importance of meaningful engagement of families in their children's learning. The chapter situates this discussion within the Sobrato Early Academic Language (SEAL) model's work with schools across California. SEAL is a PK–Grade 3 comprehensive reform focused on the needs of English learners, and is designed to create a language-rich, joyful, and rigorous education. California is an important context given the state's large EL population and recent favorable shifts in educational policy, which provide a unique opportunity for laying a foundation for improved practices and outcomes for numerous English learners. With the fairly recent adoption of college- and career-ready standards in many states, public school students are faced with meeting higher academic standards than they had previously. However, for English Learners, the complexity of the task is magnified by the fact that these students must simultaneously learn English while mastering increasingly rigorous grade-level academic content taught in English [Council of Chief State School Officers, 2012; National Academies of Sciences, Engineering and Medicine (NASEM), 2017.] In California, this task is particularly daunting given the size of the population and a legacy of policies that have limited the ability of schools to effectively teach these students. California schools are tasked with educating over 1.3 million English Learners, more than 20% of the state’s K-12 population [(California Department of Education (CDE), 2017a] and almost one-third of the EL population in the country (Hahnel, Wolf, Banks, and LaFors, 2014). At least 65 language groups are represented in the state’s EL population, however Spanish is the by far the largest language group, representing over 80% of ELs in California (CDE, 2017a). Although their sheer size has contributed to the interest in this population, English Learners have also received a considerable amount of attention since the advent of the No Child Left Behind Act (NCLB) in 2001, which placed intense scrutiny on achievement gaps between student subgroups and highlighted ELs’ relatively low academic performance. To raise awareness of their low performance, and in some cases, to raise concerns about the validity of the use of these measures with English Learners, the performance of ELs on large-scale national and state assessments were frequently cited in studies and reports in the mid-to-late 2000s (e.g., Abedi, 2004; Batt, Kim, & Sunderman, 2005; EdSource, 2005; Fry, 2007; Kiefer, Lesaux, Rivera, & Francis, 2009; Kim & Herman, 2009). However, achievement gaps between ELs and other students can be misleading. Measuring EL achievement is complicated by a number of factors. One issue is the fact that English proficiency is intimately related with academic performance in English (Abedi, 2002; Abedi & Gandara, 2006; Solano-Flores & Trumbull, 2003). In other words, a test in English is a test of English, and since ELs by definition have limited English proficiency, a test in English will provide a limited window into their true academic ability. A second complicating factor concerns the instability of the EL category (Abedi, 2004). ELs who meet English proficiency standards are no longer classified as EL. By not taking the performance of former ELs into account, this can distort the progress of ELs in a given school or district. Although EL achievement may be complicated to measure, there remains ample evidence of poor outcomes for ELs, and this evidence suggests that ELs in general have been grossly underserved since well before NCLB shined a spotlight on their underachievement. For instance, we know that a sizable portion of ELs remain classified as ELs for many years, and their academic outcomes and long-term prospects are bleak. In California, close to half of English Learners who enroll in kindergarten are likely to become “long term English Learners.” These are students who have been enrolled in U.S. schools for over six years and remain classified as an English Learner [California Department of Education (CDE), n.d.; Olsen, 2010]. ELs in high school, whether they are long term English Learners or not, are frequently tracked into lower-level classes (Callahan, 2005; 2013), are often taught by non-credentialed and/or underprepared teachers (Callahan, 2013; Gandara, 2015; Olsen, 2010), are highly unlikely to be prepared for college (Martinez-Wenzl, 2014), and are twice as likely as their native English-speaking peers to drop out of high school (Callahan, 2013). Designated English Language Development: Instruction that is provided by skilled teachers during a protected time during the regular school day. The purpose of this instruction is to develop the critical language ELs need for content learning in English. California English Learner Roadmap: A policy adopted by the State Board of Education on July 12, 2017 to provide guidance to local education agencies regarding the education of English Learners. This policy directs schools to affirm, welcome and respond to ELs’ strengths, needs, and identities. The California Department of Education has since developed several resources in support of this policy. See https://www.cde.ca.gov/sp/el/rm/ for more information. Integrated English Language Development: Instruction that is provided to ELs throughout the school day and across all subjects by all teachers of ELs. The purpose of this instruction is to strengthen ELs’ abilities to use English as they simultaneously learn content through English. California English Language Arts/English Language Development Framework: Adopted by the State Board of Education on July 9, 2014, this Framework provides guidance for implementing two sets of standards: the California Common Core State Standards for English Language Arts and Literacy in History/Social Studies, Science and the Technical Subjects (CA CCSS in ELA/Literacy) and the California English Language Development Standards. 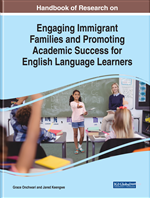 It also articulates eight values for educating English Learners, including valuing language and culture as assets; building content knowledge and language in tandem; evaluating progress appropriately; and sharing the responsibility for EL’s positive educational experiences and success among all educators, the family, and the community. See https://www.cde.ca.gov/Ci/rl/cf/elaeldfrmwrksbeadopted.asp for more information.